This cake is very famous among Chinese bloggers, the word “seckill” in the urban dictionary means the item is very popular, each transaction is made in seconds. I tried to translate the recipe to English so that readers who can't read Chinese will also be able to make this moist and airy cake as well. This is definitely another keeper for chocolate chiffon cake after my favourite recipe from Okashi. 1) Cook oil and milk till gentle boil, remove from heat and add in cocoa powder. Mix well. Add chocolate and mix till chocolate melted. 2) Add egg yolks, one at a time, mix till well blended. 3) With an electric mixer, beat egg white till foamy, add sugar in 3 additions, and beat till soft peak (70-80%) (7-8分发) (When lifted, the tip of the meringue has soft and small bend). 4) Take 1/3 of the meringue to mix with the chocolate mixture using a rubber spatula till 80% incorporated (need not mix till fully incorporated). Fold in 1/3 of flour gently, mix till just incorporated. Fold in remaining meringue and flour alternatively to form even chocolate batter. 5) Divide batter into 2 loose-bottom round 6-inch pans. Bake in preheated oven at 170C(upper heat)/ 150C(lower heat) for 30-35 mins (I baked at 150C for 20 mins and 175C for the last 10-15 mins). 6) Bang the cake on tabletop once it is out from the oven and invert to cool the cake. Loosen the side with a small knife and unmould after the cake has cool down completely. 7) To prepare chocolate ganache, combine dairy cream and chocolate and cook over double boiler, stir constantly till chocolate melted then add butter and mix well. My method is to heat up the cream till gentle boil then pour into chocolate, stir till chocolate is melted and add in butter. 8) Place cool cake on wire rack with a tray/bowl underneath and pour chocolate ganache on the centre of the cake, use both hands to hold the wire rack and swirl to let the ganache cover the whole cake. Chill for at least 30 mins or until the ganache is set before serving. 1) Adjust the sugar amount according to the type of chocolate used. If you are using normal cooking chocolate you may have to reduce the sugar further. 2) I didn’t follow exactly the ratio of the chocolate ganache, I used slightly more chocolate and I added 1 tbsp of rum in half portion of the ganache for one 6” round cake. 3) Trim the top of cake to become flat if necessary and place upside down when adding the ganache so that you will have a perfect flat top. sound good to make this cake for Birthday..
Definitely, I will make this for birthday or any occasions, I am sure this will be a crowd-pleaser. Actually if u notice there are two different cakes in the above photos , one is more glossy, that is with rum added to the ganache. perfect n awesome...really tempting v much!....love the glossy chocolate ganache! As written in the recipe, two 6-inch loose-bottom round pans are used. U can also use one 8-inch chiffon pan for this recipe. 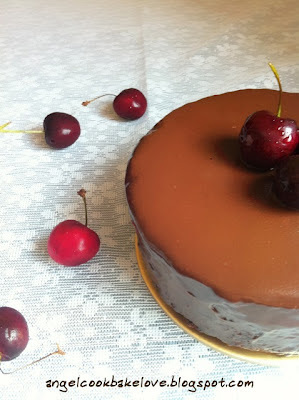 Hi angel, I baked this cake as well but have not posted yet, your cake looks so pretty especially the ganache, yum. Looking forward to reading ur post of this cake. 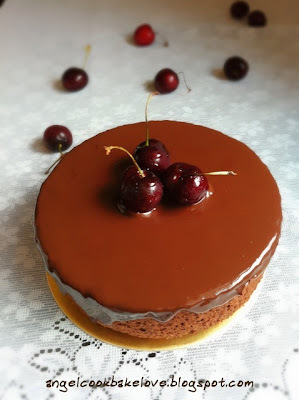 I baked these twice already,it is good enough to eat plain on its own as well.I was wondering is this actually same version as Sacher Torte without the layer of apricot jam in the middle. Yes I also think that this cake tasted good by itself. Good idea to make it into Sacher Torte by adding apricot jam. A perfect cake for chocolate lovers. Gorgeous cake. Thanks for your compliment. I feel so flattered. Low protein flour is actually cake flour. If u can't get hold of any just use normal plain flour. Oh I see :)) Thanks! I tried this. It's nice! Hi Angel, which brand of whipping cream r u using? Can I replace with non-dairy whipping cream? Please advise. Thanks in advance. I usually use Millac whipping cream from Phoon Huat or Emborg from supermarket. I have never used non-dairy whipping cream in chocolate ganache thus I can't really give you proper advice. 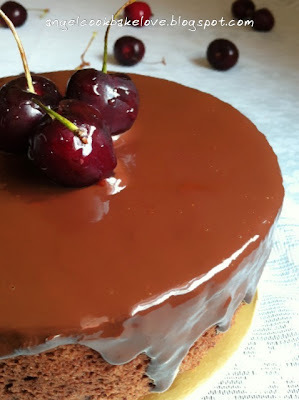 However, I chanced upon a blog, the blogger actually used non-dairy whipping cream in chocolate ganache but I think that is is fine to use non-dairy. Please bear in mind that non-dairy is sweetened so do expect your ganache turns out ot be sweeter. Persoanlly I prefer the taste of dairy cream. Can I use an 8" remove able base tin instead of a 8" chiffon cake tin? Yes, you can but baking in chiffon tin is easier to succeed.